A no-brainer – nasal sprayers are inserted inside noses. The nose is an incubator of germs. Millions of germs can be found in just one droplet of the goo lining the inside of your nose and sinus cavities. 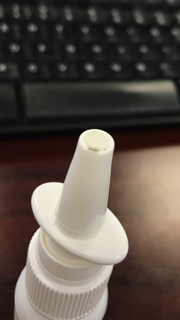 When something like a nasal spray is inserted into this germ-rich area, and then not properly handled after use, you will very likely contaminate the outside of the sprayer cap. What happens to the outside of a nasal sprayer is up the the customer. If he decides to use it, contaminates it inside his nose, fails to wash it off … and then covers this goopy mess with the outer protective cap, thereby sealing in the moisture, germs, and goop, inevitably that cap will start growing mold despite the product being antifungal. However, the antifungal liquid inside the bottle does not have contact with the outside of the sprayer and therefore cannot keep it sanitary. That is the job of the customer to follow basic sanitary practices and a dose of common sense. This customer continued to argue during several more emails even after admitting to never wiping off his cap after use. 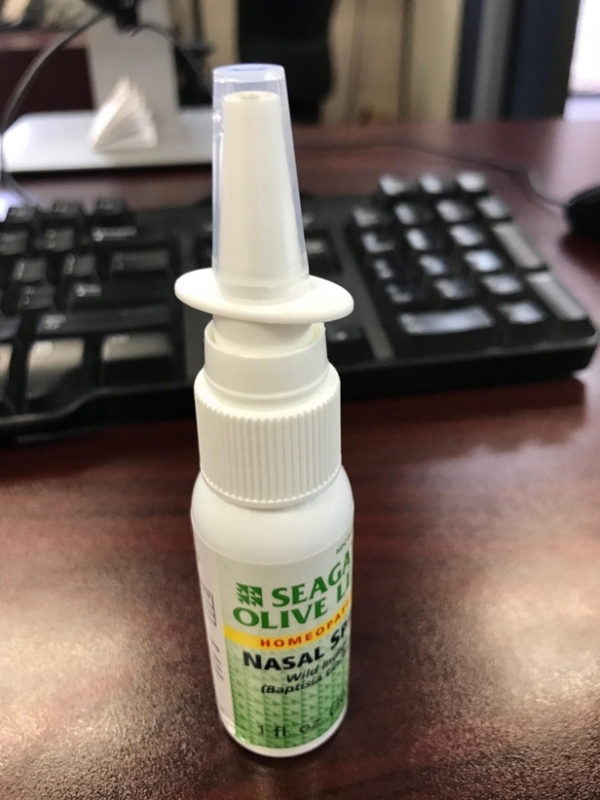 So follow the label’s instructions, wipe off the cap after each use, and be sure not to share the same nasal spray bottle with a friend … and you will be protect yourself from germs. 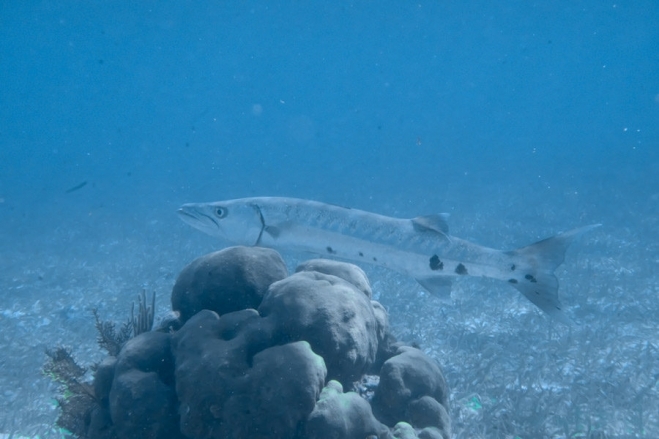 Today’s photo is of a juvenile barracuda patrolling his reef. Normally these guys are easily spooked if you try and approach them directly. The best way to capture them in a photo is to swim parallel with them and aim the camera to the side so that you do not present yourself as a threat. The coloring of this photo is blue because he stayed beyond the effective range of the strobe lights. At this depth, all but the blue and green light wavelengths are absorbed by the water column. Aaron - Obviously, the customer is NOT always right. It’s nice to see a company that isn’t afraid to hold a customer accountable for their negligence. These days, people complain about nearly everything. In turn, as a result of their fear of negative feedback, most companies accept the blame and bend-over for the customer. This, of course, perpetuates the problem. Richard (Founder) - Thanks acknowledging this. It seems like with the anonomous nature of emails, customer website comments, and social media …. we have developed a generation of whiners who believe that they are entitled to anything just because they complain.